LEWISTON — In a classroom at the University of Southern Maine’s Lewiston-Auburn College, Dutchess pressed against Jesse Abrams’ side, a move that will be important when the 52-year-old Navy veteran needs help maintaining his balance. Amid the chaos of other dogs and strange people, she kept her focus on him, necessary to gauge his anxiety. She stuck close by her human, a habit that will help ease Abrams’ post-traumatic stress disorder when they’re out in the world. But walking well on a leash? That will take the 5-month-old shepherd-Lab mix a little more time. “Polite walking, good luck,” Abrams joked, already tangled in Dutchess’ pink camouflage leash. For the next several months, Abrams and Dutchess and a handful of other veterans and their dogs will spend an hour a week training and learning to work together. They’re a diverse group: men and women, vets with decades in the service or just a few years, holding on to tiny Chihuahua mixes, energetic Labs and one 119-pound German shepherd. But they had one thing in common: At the end, each pair will become a service dog team. “I believe she’s going to help me a lot,” said Abrams, who lives in Bowdoinham and deals with medical problems and anxiety. 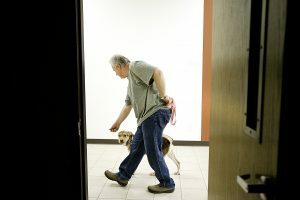 The half dozen vets and dogs gathered as part of a free program run by Embrace A Vet, a Harpswell-based nonprofit that helps Maine vets who have experienced a traumatic brain injury or are dealing with post-traumatic stress. As part of its work, the group pairs vets with dogs — usually adopted from a local animal shelter — and provides training, all for free. 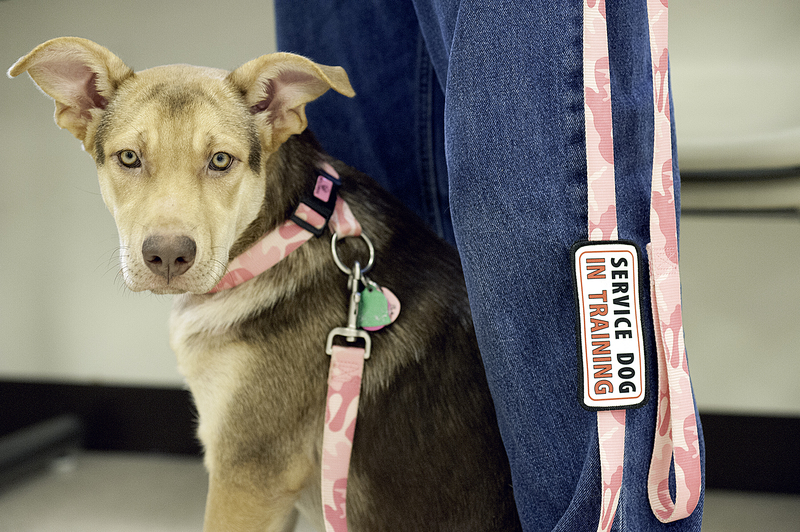 Joy Johnson started the program in 2013 when she learned there were few options available to vets who could use a service dog. The U.S. Department of Veterans Affairs will pay for service animals only for vets whose mobility is impaired, leaving out vets with PTSD and other conditions. And while other service dog training programs existed, Johnson could find none in Maine that were free to the vet. It costs Embrace A Vet about $1,500 to adopt and train a dog. In the past two years, her program has graduated 18 teams. 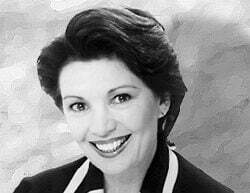 Six are training now; she hears from more hopefuls every day. Although some vets seek to train a dog they already have, Embrace A Vet typically finds adoptable dogs for them, often from the Coastal Humane Society in Brunswick. A few of the dogs have become basic companion animals for vets who simply needed the comfort and security of a furry best friend. But most of the Embrace A Vet dogs have become service animals, trained to help a veteran by doing physical tasks, maintaining a buffer of space in large crowds or recognizing their human’s growing anxiety before it becomes overwhelming. “He’s going to calm me down — after I calm him down,” said Roger Gauthier as his dog, a 5-month-old yellow Lab named Bud Light II, danced around his chair during training and tried to get Dutchess to play. After 22 years in the Army Medical Corps, Gauthier, 73, struggles with post-traumatic stress. He’d had a dog before — Bud Light I — but that Bud wasn’t trained as a service animal. The latest trainees, whose dogs range from 5 months to 2 years old, have been working together for about a month. Already there’s been progress: young Chihuahua-mix Henry sits on command, Lab-mix Libby presents her paw when asked, Dutchess is starting to learn to walk nicely on a leash. Trainer Sandra Pond’s philosophy involves a lot of praise, a lot of treats and a lot of focus on the human half of the team. “I’m a softy — I tend to give into him more than I should,” admitted 66-year-old Gladys Jones of Lewiston, who spent three years in the Navy and now hopes 7-month-old Henry will help ease her anxiety in public situations. It will take four to six months for the dogs to be fully trained. 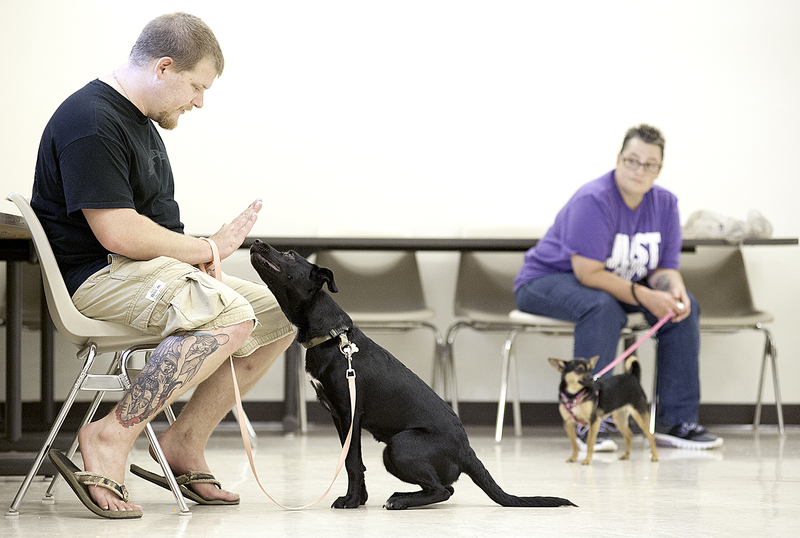 They must pass American Kennel Club’s Canine Good Citizen test, learn how to complete the three most important tasks their vet needs from them and pass a series of tests designed to show they can function well and behave in public situations. 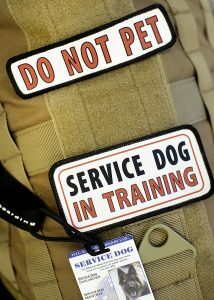 At the end, they earn a vest and service dog patch and will be registered with the United States Service Dog Registry. Some dogs don’t make it through. Usually they’re the vet’s own pet — not a dog adopted from the shelter — and usually they fail at the beginning, during the initial evaluation to determine whether a dog is too shy or too aggressive to become a service animal. But most who start training do graduate. Some, such as Abrams and Dutchess, seem destined to work together. He went to the shelter to pick out a puppy. A puppy picked him out instead. Dutchess hasn’t left Abrams’ side since. Have an idea for Animal Tales? Call Lindsay Tice at 689-2854 or email her at [email protected].